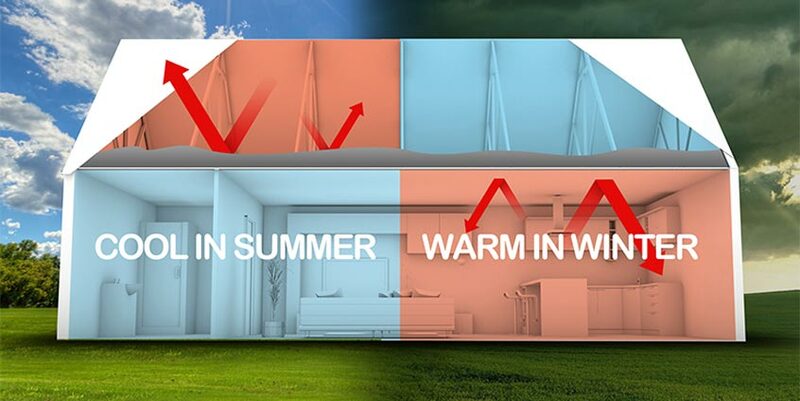 Thermal insulation acts as a barrier to the movement of heat, therefore slowing down the escape of heat from a building in winter (when the outside temperature is lower) and the entry of heat into a building during summer (when the outside temperature is higher). To change the temperature of an object, energy is required in the form of heat to increase temperature (e.g. by using heaters), or reduce temperature (e.g. by using air conditioners). Once the heat generation or heat extraction stops, a reverse flow of heat happens and the temperature returns to ambient. To maintain a given temperature considerable continuous energy is required. Insulation reduces this energy loss. The movement of heat in, say, a roof-space is achieved by all three means but mainly by convection and conduction. Certain insulating materials act as radiant barriers, convective barriers and conductive barriers. However, certain very commonly used materials such as foil insulation contribute almost exclusively to the control of radiation only, by reflecting heat. The purpose of Eco-Insulation is to trap a dormant layer of air inside a stable fibrous insulation layer. This effectively stops convection and conduction by means of the entrapment of a large volume of air, a poor conductor of heat. Look for the "R-value." "R" means resistance to heat flow. The higher the R-value, the greater the insulation power. The R-value must be disclosed for most insulation products. For instance, if you buy loose-fill insulation with an R-value of 1.97 from Company A, it will have the same insulating power as loose-fill insulation with an R-value of 1.97 from Company B. You also can compare the R-value of one type of insulation to another, such as loose-fill to blanket. Specifications & Thermal Conductivity information. Thermal Conductivity is the rate with which heat travels through a material. It is the reverse of R-Value.